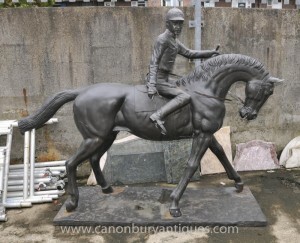 Gorgeous lifesize bronze horse and jockey statue originally by French artist Isidore Bonheur. The horse and jockey is perhaps one of the most popular subjects in bronze art and right here we have one of the best examples we have ever seen. This is a later recasting of the famous ‘Winner of the Derby’ bronze by the artist Isidore Bonheur (1827-1901). The bronze is a fine brown cast for the horse and a darker brown for the jockey and base. This piece is over six feet tall. It’s massive and would make for a great garden sculpture and can live outside with no fear of rusting. Great for a stable or something. The patina to it is fantastic and the piece is offered in perfect condition. This is a later recasting from the original. Isidore Bonheur’s bronzes range from domestic cattle and sheep, which he excelled at, to wild bears and lions as well as equestrian and hunting groups, all done in a very natural and realistic manner. Many of his bronzes were done as compliments to his sister’ works. These sheep and cattle models by brother and sister were done as pairs. Though somewhat overshadowed by his flamboyant and outspoken elder sister Rosa, Isidore Bonheur was nevertheless was a highly accomplished sculptor and his works rank among the finest of the French Animalier school. The Perigueux Museum exhibits a life-size version of his eight point stag. Among the monuments that he cast were, his sister’s memorial statue at Fontainbleau completed in the last two years of his life, and two stone lions for the Palais de Justice. Isidore Bonheur’s Royal commissions extended beyond France where he was commissioned to produce two monumental Bulls for the Palace of the Sultan in Constantinople as well as works for King Edward VII of England. 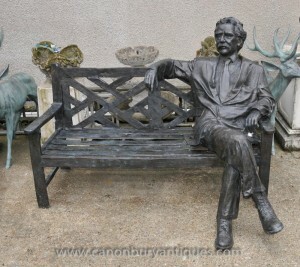 His bronze sculptures are always signed I. Bonheur and the earliest Peyrol casts from the late 1840’s are unmarked. – Aggh, you know when it’s one of those days and you want to sit down and chat with the worlds most famous theoretical physicist about the theory of relativity?